For me, programming while flying is a form of therapy. 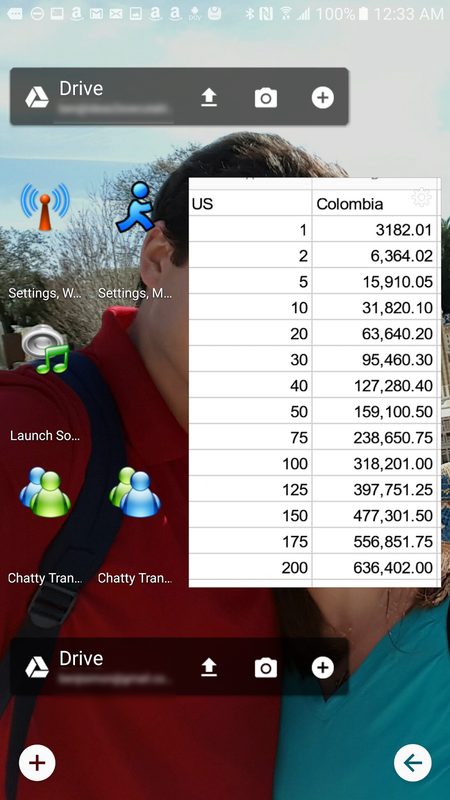 However, on our last trip to Colombia I struggled to think of a useful app to code. That is, until we started our descent into Bogota and the ideal problem hit me. I should whip up a quick and dirty currency converter to help me make sense of the crazy prices I was seeing in the guidebook. 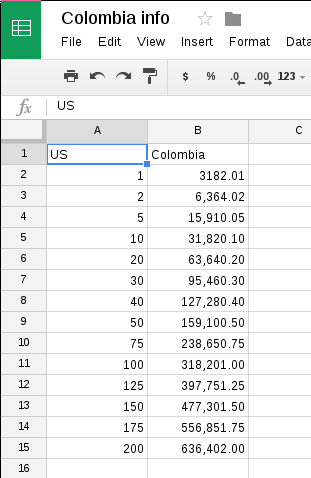 See 1 Colombian Peso (COP) is .00033 dollars, a conversion that I hadn't quite wrapped my head around*. When I saw prices like 37,000 COP I had no sense of value. Sure, I could bust out the calculator on my phone, but whipping up some slick little app seemed like much more fun. I opened up Tasker and went right to work fiddling with the scenes capability. However, it wasn't long before a flight attendant came on the PA: it was time to stow those tray tables and pack away loose belongings. Argh. I had run out of time. I put my bluetooth keyboard away and resigned myself to having failed my little programming challenge. So now I knew that the 37,000 COP tchatchke was about 12 USD. This was progress! 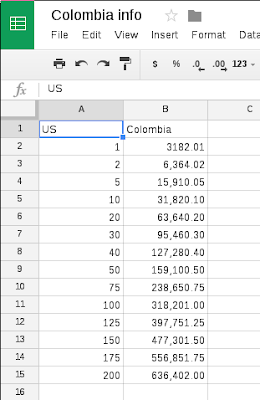 The Google Spreadsheet solution was a step in the right direction, but did have it's own issues. Mainly, *getting* to the spreadsheet was a pain. If I was in a store, it wasn't going to be especially practical to open Google Drive, navigate to the right folder, open the document and then consult the chart. Surely I could do better than that. By now I was starting to catch glimpses of the mountains outside of Bogota and my little hacking session was definitely coming to a close. As we touched down I had to smile: Mission Accomplished! I now had one click access to currency conversion, and I'd solved the problem in less time than it took for the plane to land. And best of all, I was so busy problem solving I forgotten to be terrified. *After a few days, I got used to dividing all the prices by 3,000, so this was hardly an app-worthy problem. But for those first few days, keeping track of all those zeros was apparently more than my little brain could handle.